At Athboy Physiotherapy and Sports Clinic we run group Pilates classes at Beginner, Advanced Beginner and Intermediate level and also use Clinical Pilates programmes as part of the Rehabilitation of Lower Back Pain and other injuries. Pilates is a method of exercise designed to improve physical fitness, core strength and stability, posture, flexibility, coordination, concentration and wellbeing. At Athboy Physiotherapy we use and teach Clinical Pilates, which is a type of Pilates that has been modified by Chartered Physiotherapists who have linked recent spinal stability research with the original concepts and exercises used by Joseph Pilates. Pilates was first developed by Joseph Pilates in the early 1900's. Joseph was a dancer and gymnast based in New York City who was very ill as a child and began working on making his own body strong, flexible and mobile. He was one of the first to study movement patterns and explain imbalances within the human body and developed his Pilates method to allow the body to move freely and safely. Currently across the world there are a number of Pilates' instructor training schools. 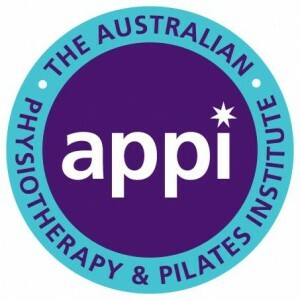 Our instructor has completed training with the Australian Physiotherapy and Pilates Institute (APPI). Pilates is for everyone, no matter your age, gender, fitness level or activity Pilates will benefit you. Pilates has been proven to be especially beneficial for people with lower back pain, poor postures, neurological conditions, mental health conditions, sports injuries, arthritis and before and after Pregnancy. There are many, many benefits. Improved posture, flexibility and mobility, increased strength and spinal stability, increased core stability, improved coordination and concentration, reduced stress and tension levels, injury prevention, improved body awareness, non-impact exercise, enhances sports performance, improves circulation. Our Pilates instructor, Siobhan, has a Bachelor of Science Honours Degree in Sport and Exercise Rehabilitation, a Higher Certificate in Physiology and Health Science and 5 years' experience working in a clinical setting. 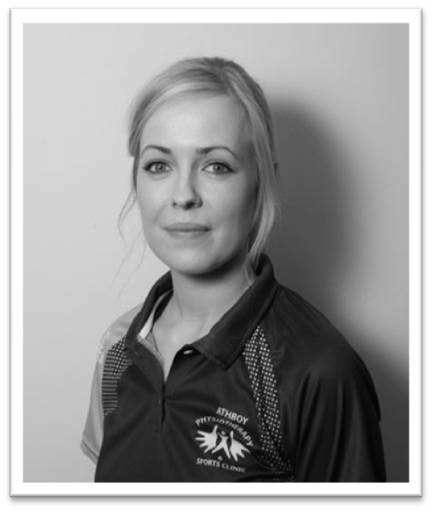 She is currently director of Sports Injury Rehabilitation at Athboy Physiotherapy and Sports Clinic and works with patients on a daily basis with musculoskeletal pain and sports injuries. She has completed training with the Australian Physiotherapy and Pilates Institute (APPI). All you need to bring is yourself. All mats, weights, head cushions, blocks, soft balls etc. are provided. Just wear comfy clothes to allow you to move and stretch out easily. 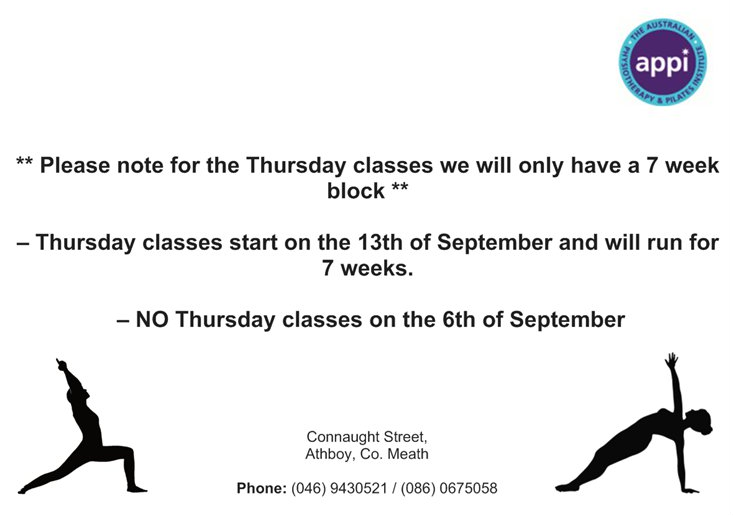 To book into a class give us a call on (046) 94 30521 or (086) 0675058. Classes usually run for 6 or 8 week blocks and we have both morning and evening classes available at all levels. Please phone us to see which level will suit you best. Our most recent timetable is shown below but please check the dates as this is subject to change. Our next block will begin after Easter, starting Monday 4th April. 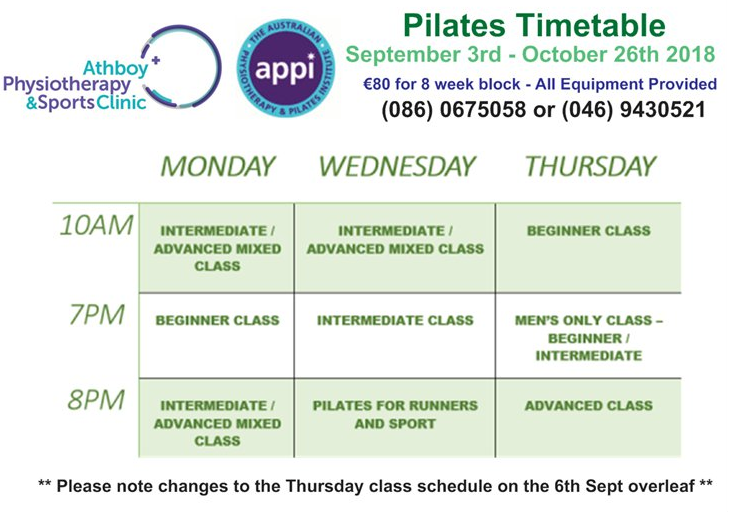 At Athboy Physio our Pilates classes run in 6-8 week blocks and you have the option of taking part in 1-2 or as many classes as you would like per week. We have morning and evening classes Monday, Wednesday & Thursday at 10am, 7pm and 8pm. Our most recent timetable can be seen below but as some classes may be full/changed please contact us directly.